A brief history of the Cabra Grand Cinema. | Come Here To Me! « CHTM! presents: An evening of music, talk and more. A brief history of the Cabra Grand Cinema. On 17 April 1949, the Cabra Grand Cinema on Quarry Road was formally opened. The Lord Mayor of Dublin, John Breen, opened the 1,600 seat cinema by cutting a tricolour ribbon with a pair of gold scissors. The cinema was designed by Samuel Lyons, and in a move that captured the spirit of the time, the building was blessed by a priest from the nearby Christ the King Church in Cabra. After the formalities, the comedy Sitting Pretty was shown. 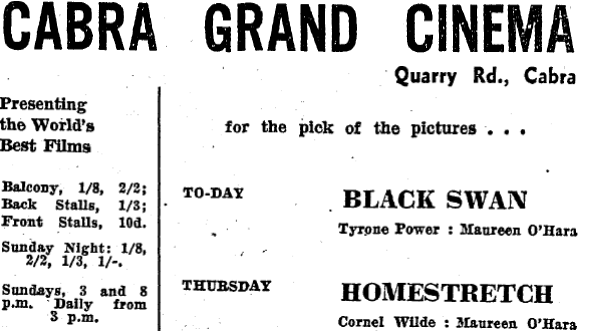 The first two films listed at the cinema in newspaper advertisements (the below advertisement appeared the day after the opening) both featured Maureen O’Hara, and the cinema boasted that it was “equipped with the latest RCA sound system”, to give cinema goers a top class experience. Advertisement for the new cinema. The first manager of the cinemas was Louis Marie, an interesting individual who had seen action during the revolutionary period. Marie had been a member of the Fianna Éireann republican boy scout organisation, and took part in the Easter Rising in 1916. His name appears in a few of the statements given by participants in the Rising to the Bureau of Military History. Gearoid Ua h-Uallachain, who took part in the attack on the Phoenix Park magazine fort at the beginning of the rebellion, noted that “Louis Marie, manager of a picture-house”, was among those involved. One newspaper article from the time of the cinemas opening claimed that Louis had served in both the French Army and the Irish Army. GARDAI from many parts of the city were hurriedly picked up by patrol cars and rushed to Quarry Road, Cabra, last night, to disperse a hostile crowd of nearly a thousand people who had surrounded the Cabra Grand Cinema and threatened two women who had taken refuge there. Weapons brandished and thrown included sticks, stones, bricks and bottles. One Garda, as he was pushing through the shouting and jostling mass, was struck by a brick in the back, but was not seriously injured. To force the crowd away from the cinema doors, which had been closed, Gardai had to draw batons and a number of shots were fired over the crowd’s heads…. The incident had its beginning shortly after nine o’clock when the two women concerned were apparently canvassing in the Quarry Road’area for signatures in connection with a “peace petition” to ban the atomic bomb.It appears that as they were going from house to house the impression that they were members of a Communist organisation got around and they were soon surrounded by a hostile crowd. There was more drama at the cinema in 1953 when it was held up by two men armed with what appeared to be a pistol. At the time of the robbery the cinema was showing The Apparition, a religious film which was being screened as a fundraiser for the African Missions of the Holy Ghost Fathers. £6 10s was taken on that occasion. By the late 1950s, television was the big fear for the owners of Dublin’s suburban cinemas. The biggest problem for cinema in Ireland, one official warned in 1959, “would be the advent of television on a national basis.” Many of Dublin’s suburban cinemas closed their doors throughout the 1960s and 70s, but others took on a new lease of life as centres of their communities. Jim Keenan notes in his study of Dublin cinemas historically that “by the late 1960s, the Grand has become economically unviable and it closed on 31 January 1970. The last film shown there was The Big Gundown.” The Cabra cinema was purchased by Gael Linn in 1975, and like other suburban Dublin cinemas it became both a bingo hall and a concert venue. 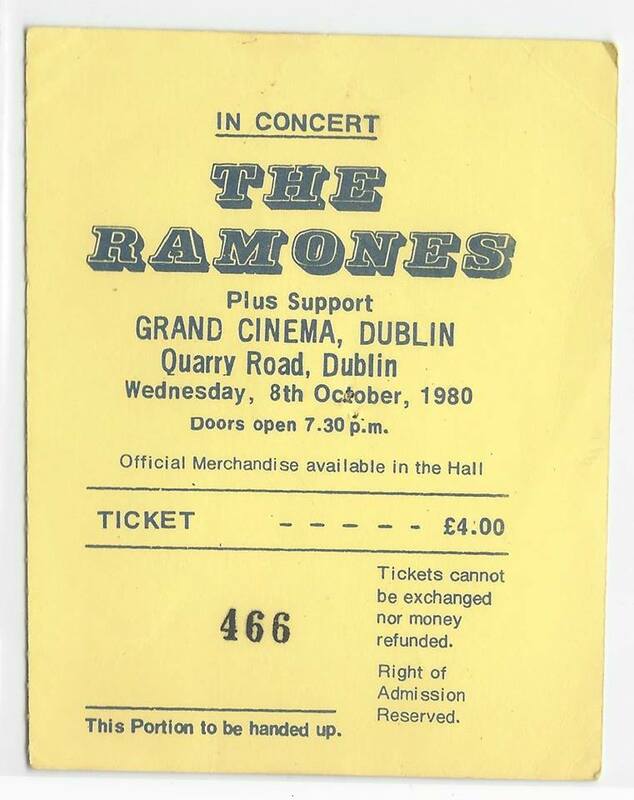 Ticket to the Ramones gig at the Grand. Uploaded to the brilliant Facebook page ‘Classic Dublin Gigs’ by James Aquafredda Sr. The old Cabra cinema witnessed a number of celebrated, and in some cases infamous, rock concerts. Indeed, the behaviour of some youngsters after one gig led to a Dublin District Court decision that no more rock concerts could be held in the cinema in 1980. In November 1980 it was reported in the Irish Press that “Gardaí told the court that gangs of youths lay in wait to attack patrons of rock concerts at the cinema.” One source blamed the violence on a “Mod and Skinhead element in Cabra who are always fighting among themselves.” Four stabbings were reported after the legendary U.S punk band The Ramones played the venue. Joe Breen, a journalist with The Irish Times, rushed to the defence of the cinema by noting that the trouble had not only taken place after the gig, but had happened far from the venue. “There is enough trouble at gigs without it being invented”, he noted. Going into the gig, the organisers claimed that the 1,000 or so in attendance were frisked and even had their belts taken from them. Of the gig itself, Breen was far from blown away, writing that “the concert in the end was something of an anti-climax. The excitement had more to do with expectation than with experience.” The Ramones were no strangers to Dublin cinemas, haven performed two years earlier in the State Cinema, Phibsboro. 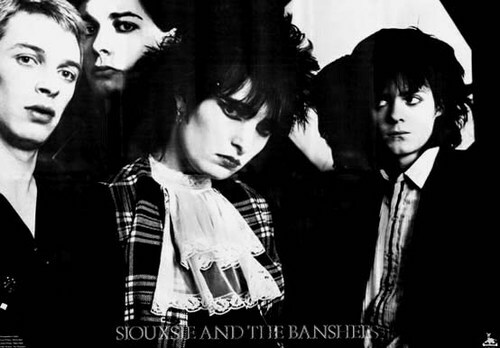 Siouxsie and the Banshees, who performed in Cabra in 1980. Today, the old cinema remains very much a part of the community around it, with regular bingo nights drawing huge crowds. It, and other once thriving cinemas, are an unusual feature of suburban architecture in Dublin, and hopefully the buildings will be preserved long into the future. Many local people have great memories of films, concerts and more at this venue and we’d love to hear from you in the comments section below if you’ve a story to tell about it. Excellent article Donal. Those big suburban cinemas had a short life really before either reinventing themselves (like Cabra) or being knocked. Fortunately enough survive, in Dublin as elsewhere, to have attained listed, or at least historical, status. Who would have foreseen that growing up in the 50s/60s? Sorry but wrong pic of the Banshees. It was the McGeoch/Budgie line up of the Banshees that played there in 1980. They were touring in support of ‘Kaleidoscope’. They stayed in the Crofton Airport Hotel. They played Belfast the night before and Siouxsie was interviewed by Gloria Hunniford on the UTV teatime news show. my brother in law left that Banshees gig with a siouxsie shoe…i’ll get him on to give you the story from the horses mouth. Look forward to reading it. When Siouxsie came on she sat on a barrier separating the stage from the audience. A girl who was a Siouxsie lookalike (but had ‘Toyah’ painted in white on the black dinner jacket she was wearing) grabbed her and would not let go till the bouncers got her off. Maybe the shoe came off in the scuffle! The Banshees were very loud. My ears were ringing for 3 days! Christie Moore and Planxty also ‘played’ the Grand but the concert was cancelled on the night because so few attended. Great article. Have lived on Quarry Road for over 30 years and never heard of the riot. I attended many movies there when I was young. In particular I remember watching the move ‘Squadron 663’, the airplanes filled up the screen and looked so imposing to one so young. I can still here the movie theme music in my head. And who could ever forget the big ‘golliers’ flying down from the balcony with great accuracy and hitting your head. Later, the Cabra Grand is where I learned to play Bingo with my Mam. I loved to go and sit there with the Ladies and listen to their chatter, amazed at how quickly they could fly through the numbers in front of them marking away… legs 11… whistle, whistle. If it was a lucky night and Mam went home with a few bob in her pocket, she’d pick up some chips at the chipper next door and take them home. My Dad always knew she’d won when he’d get the whiff of salt and vinegar as she arrived in the door, yum! Those were the days. Great memories. My nan worked there from 1949. Love listening to her stories. She says Louis Marie was a proper gent she loved working for him. She knows nothing about the riot or story of the two women though. Great to hear that. Louis Marie was my grandfather. Hi Elisa, I would be very interested in finding out if your nan has any photos of that time I could possibly take a copy of?? I’m local to Cabra myself and in DIT Grangegorman doing an art degree, I want to do a site project and have picked the grand/bingo hall so any info or pics I could get hold of would be great. In the 1950’s myself and my two pals had “permanent seats” for Sunday night’s in The Grand .It was great to have our own picture house .